As Principal Lau Sin Peng points out in her recent book, Portugal’s announcement of neutrality in WWII may have offered Macau a veneer of protection from Japanese military assault, but it did not shelter the tiny colonial city from the tumult and cataclysm around it. 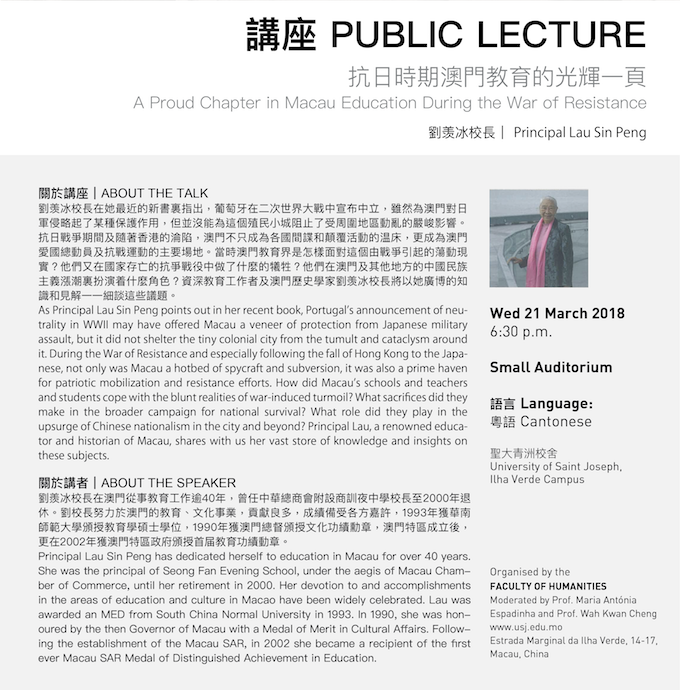 During the War of Resistance and especially following the fall of Hong Kong to the Japanese, not only was Macau a hotbed of spycraft and subversion, it was also a prime haven for patriotic mobilization and resistance efforts. How did Macau’s schools and teachers and students cope with the blunt realities of war-induced turmoil? What sacrifices did they make in the broader campaign for national survival? What role did they play in the upsurge of Chinese nationalism in the city and beyond? Principal Lau, a renowned educator and historian of Macau, shares with us her vast store of knowledge and insights on these subjects. Principal Lau Sin Peng has dedicated herself to education in Macau for over 40 years. She was the principal of Seong Fan Evening School, under the aegis of Macau Chamber of Commerce, until her retirement in 2000. Her devotion to and accomplishments in the areas of education and culture in Macao have been widely celebrated. Lau was awarded an MED from South China Normal University in 1993. In 1990, she was honoured by the then Governor of Macau with a Medal of Merit in Cultural Affairs. Following the establishment of the Macau SAR, in 2002 she became a recipient of the first ever Macau SAR Medal of Distinguished Achievement in Education.